Premier Auto Trade is a leading wholesaler of quality Engine Management and Service Components and are a major supplier to the Australian automotive aftermarket. The Premier Auto Trade Racing and Performance portfolio includes high quality products designed for high performance and race conditions, including fuel pumps, fuel pressure regulators, fuel injectors, air filters and performance accessories. The Premier Auto Trade Racing and Performance offering includes products from the Worlds leading manufacturers including Bosch, Delphi, VDO, Walbro, Rochester, Pierburg, Denso, UNISIA JECS, Malpassi, SARD, Fuelab, Turbosmart, Haltech and BMC Air Filter, with exciting new products and developments due in 2014. As part of their growth into the performance and racing aftermarket Premier Auto Trade has partnered with several race teams, where the parts they sell can be used and tested in real race conditions. 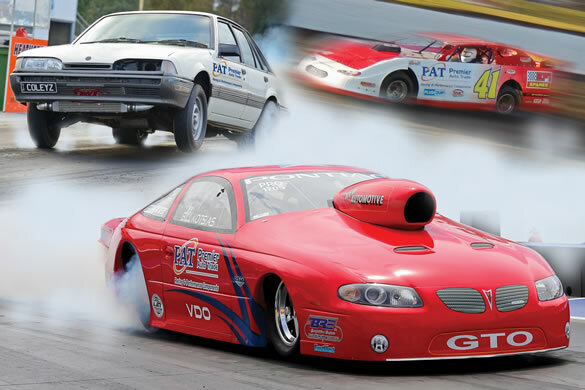 In conjunction with VDO Australia they are supporting Team Pontiac in the ANDRA Pro Stock Drag Racing Series. The car is currently the fastest Pro Stock to run at Willowbank Raceway in Queensland with a 6.98 second run at 195mph. The Bink Motorsport Late Model Speedway Championship car also carries the Premier Auto Trade colours, along with BMC Air Filter and PlusQuip Tools and Equipment. The number 41 car had a great debut race with a 1st and 2nd in the heats at the Thunder Series at Toowoomba in November 2013 and is geared up for a successful 2014. As the exclusive Australian and New Zealand distributor for BMC Air Filter Premier Auto Trade also work with several V8 Supercar Teams. BMC has enjoyed many years of success in the Australian V8 Supercars Championship with BMC Team Partners winning 8 of the last 9 championships, and 8 Bathurst 1000’s. BMC Air Filters, designed and manufactured in Italy, were originally developed in association with the Ferrari F1 Team. BMC Air Filters are the most successful filter in many sports categories including; Formula1 Champions 9 times, Australian V8 Supercar Champions 8 times and 11 Le Mans 24 Hours titles.